How many students experience a first day of school where they walk in excited, but leave utterly confused? Every year, hundreds of schools implement new software and expect us to master the programs. Their intentions are great and, if implemented correctly, those tools serve to better the classroom experience. However, this is not always the case; in many instances the learning suffers. That is why Educate’s mission is vital to students in this modern era of education. Coaches from Educate inspire teachers to innovative instruction by integrating high quality technology. When I say hurting the classroom, I am not talking about how students can be distracted by the internet or their phones. Software that is implemented by the school itself can be just as harmful. This happened during my junior year in high school, when my Honors Pre-Calculus class switched to the Flipped Classroom Model. 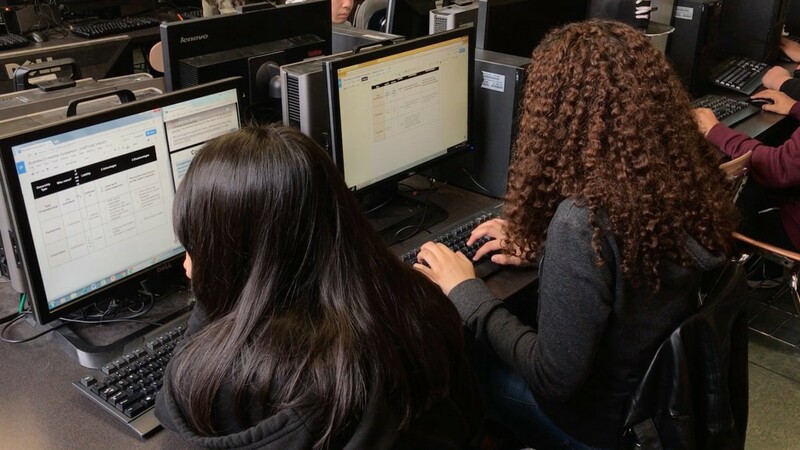 In a Flipped Classroom, students learn content through online lectures outside of school and apply the new knowledge during class time through various activities. Image from: AJ Cann, Creative Commons. It seemed like a great system, that is until my school implemented a program called ALEKS. ALEKS was an online course study program that gave us questions based on topics set by the teacher. While the program was not designed to teach students, ALEKS could be used to assess our understanding of content. However, like many others, my teacher fell into the trap of using ALEKS as a replacement for himself. He truly believed we were learning when in reality, many students were simply looking up the answers. ALEKS provided review and assessment for the basics, but we were left to our own devices to learn more. Many students either resorted to an online calculator or outdated, incomprehensible articles. The following weeks felt like a total waste of time. I still remember when the first test rolled around and every student looked at the first page and said, “You never taught us this.” My next year in AP Calculus BC was my toughest course yet, simply because I did not learn enough in Pre-Calculus. Technology does not have to be detrimental to learning. The goal of integrating technology is to provide an easier and effective academic environment for teachers and students. Quality educational technology allows students to capture the material and utilize it to enhance their learning. What else does it have to offer? The answer is quite clear: marketable skills. Students practice marketable skills when utilizing technology in a creative way. As we look towards the future, we can see changes occurring in the professional world. Being familiar with computers is required for most positions today; many even require a specialization in technology such as programmers, engineers, web-designers, etc. Students that have quality experience with technology in the classroom are well prepared for their future work environment. For instance, while many are able to use Microsoft Word with ease, do they also have experience with software such as Photoshop, Illustrator, Premiere Pro, or Final Cut Pro? Speaking from personal experience, these types of programs allow students to develop universal skills that can be applied anywhere. An aspiring graphic designer may begin to use Photoshop in their school. He/she may take on projects for the school, students, or faculty and develop his/her professional portfolio. Students that go through that journey learn how to become self-starters and create unique opportunities. While working with people on numerous projects, they learn to collaborate and problem solve. In addition, they have already constructed a small professional network. At a young age they have already begun to meet the requirements of the professional world, just by experiencing quality educational technology. It is quite simple really. Technology is a great tool, not only for teachers, but for students to better prepare themselves for the world. They can practice important skills and build their resume while still in school. However, if a school tackles a new program or tool without the support of an expert, they may implement it poorly. This can lead to harmful results in the classroom. That is why it is crucial to have a coaching staff like Educate to guide schools, teachers, and students into implementing whatever tools they need. To be a teacher you must first become a master and to be a master, you must first learn. Saaif Ahmed is a recent graduate of high school and is currently completing an internship with Educate LLC. He enjoys using his passion for technology to help students and teachers implement different online tools. Saaif will attend Rensselaer Polytechnic Institute in the Fall of 2018 to study Computer Engineering. Look forward to hearing a student’s perspective in upcoming posts! Originally published at educatellc.com on July 26, 2018.